I recently found an unlikely ally — A Judge! Actually, he is a retired Court Commissioner, (Court Commissioners hear family law cases in this state) and had been on the bench for 25 years. This judge spoke to a conference of family law attorneys promoting mediation and collaborative law. 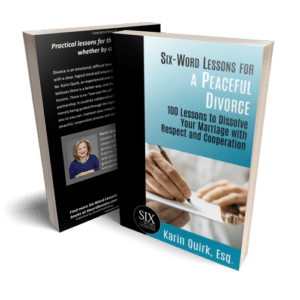 From his point of view, there are many reasons couples should consider alternative dispute resolution. In the future, I hope to have him write a guest column for me but in the meantime here are some points to consider. Judges have to consider case law as precedent — Judges are bound by laws made by the state legislature often in response to a particular case and various previous cases that have been determined by higher courts. You may think your case should be an exception to those laws. The judge may even vehemently disagree with those prior cases or legislation. Judges don’t make new law and will rarely find exceptions — even if the case is argued brilliantly and the facts appear unique to you. The Judge doesn’t know the case as well as you do — The people who have the most information about the case are the parties. They, in turn, translate that information to their attorneys who then translate it for the Judge who has a very short time to digest the information and make an informed decision. A lot may get lost in translation. One Judge described this to me as a pyramid with the parties at the base and the Judge at the very top. As you move up the pyramid there is less and less information. Even the experts and witnesses have only part of the story. Add to this the fact that the courtrooms are overcrowded, Judges may be hearing many cases in one day and Judges may have their own preferences or biases. Some are open to creative solutions and some are very traditional. Most of the Judges are fair and they are competent but they are still strangers to your particular situation. Going to court is the most expensive option available; not just money but time and emotional trauma.